I like shoes – and fashion in general, actually – which are sleek, simple and unfussy. Dolce & Gabbana, on the other hand… well, their designs are rarely any of that. “Elaborate”, “OTT” and “ornate” are all words I’d use to describe many – although by no means all – of this brand’s designs. Those three words could all be applied to these ‘Keira’ sandals. 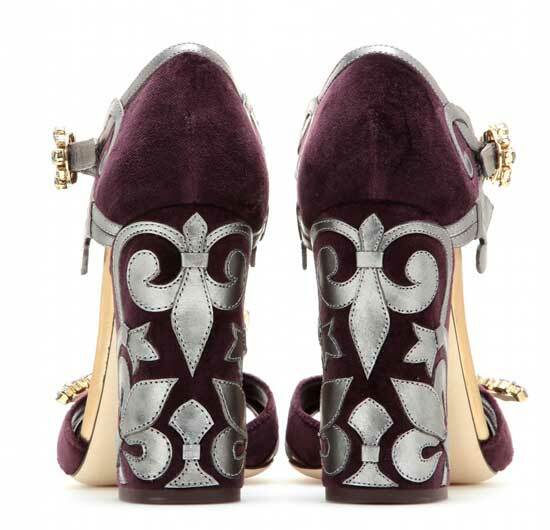 In a rich, plum velvet, and with dragonflies on the toes, brooches on the strap and gold leather appliques on the heels, this is a whole lotta look. You know what, though? I like it. And I bet I’d like it even more in ‘real life’ too. It’s not the type of thing I normally go for AT ALL, but they have a wonderfully decadent feel to them which I really like. I particularly like the toe detail on these (the crystal embellishment is beautifully done, although I’d imagine it could be something of a trip hazard: I know I for one would spend a lot of time looking down at my toes! ), but the chunky heels also make a nice change from stilettos, and will probably be easier to balance on, too! I happened to bookmark the sweater and coat from this set the day before I came across the shoes, and was happy to find they were the perfect match! Quite a few of you said you’re fans of the current mini skirt revival, so I’ve included one of those, too: this leather mini is by Alexander Wang, but I’m sure it won’t be too difficult to find a more affordable version on the high street, or even eBay! Finally, thick tights are a necessity at this time of year, and these ones are more-or-less the same shade as the shoes! I like everything about them except the chunky heels! crystal embellishment is my weakness..i love this shoes!